I don't know about you, but I have managed to accumulate a rather large collection of various computer programs that I do not use. Some I do not use because I have found programs that do what they do, only better. Some I do not use because, frankly, I do not need to do what they do. Some I do not use because I do not like them. And then, there's the majority. These I do not use because, however much I would like to do what they do, I simply do not have a spare two months of intensive training time to learn how to make them do anything other than take up space on my hard drive. So, that Herculean spreadsheet program lies flaccid, with nary a digit to exercise its quantitative brawn. And that mega-powered, hopped-up, super-secretary database manager that promised to bring order into my garbled existence, remains, after a full year of residence on drive C, with nothing more to organize than her own silly demo database of Acme machine parts. And let's not even talk about that $500 graphics program that I dedicated three days of my life to with nothing more to show for my effort than a mediocre logo for some make-believe business out of the so-called easy training guide. Now, mind you, these are all top-of-the-line programs with raving critical reviews, documented popularity, and intense software-snob appeal. And perhaps I should mention that I am not a computer neophyte, and I do believe my technological savvy has advanced over the years to a caliber somewhere slightly above "The Dummies Guide To...". So how come Lotus, Corel, Adobe and gang wait futilely for my attentions? Easy. They are hard. They are complex. They are intimidating. I have a life and I do not have time to learn them. Which segues quite handily to our subject at hand. Namely, Kepler from Cosmic Patterns. The very first thing I noticed about this deceptively unpretentious program is its learning curve. On a scale of one to ten -- one being, let's say, Pong, while Autocad and Photoshop vie up there at the top for the ten spot -- Kepler is approximately a glorious two. Kepler is unabashedly effortless. Kepler is painless. Kepler is easy. I mean, we're talking a total pushover here. Okay. I know what you're thinking. Easy is all well and good and everything, but perhaps not ultimately worth the seemingly inevitable trade-off of program prowess. It's true, we all want easy, but what we really want is to have our easy and eat it too. Particularly for advanced and professional astrologers, enlisting a scrawny, dim-witted calculation program as your business partner simply because it's easy, makes about as much sense as hiring a toddler with legos to build your house simply because it's really cheap. So let me assure you, right here and now. Kepler is no sand-in-the-face wimp on the silicon beaches of the great cosmic processor in the sky. Granted, Kepler is no mesmerizing visual stunner either, which would have to be my only niggling criticism. But whereas I would shamelessly, hands-down, pick Mel Gibson over El Dorko Egghead as a play pal, I would just as assuredly pick brains over beauty when committing to either an instructor or a business assistant. Don't get me wrong, it's not like Kepler is the computer application equivalent of Quasimodo - it's just more Amish than aureate. Kinda plain. But skillful and adept, and quite neighborly. So although Kepler's initial strength unquestioningly lies in its friendly ease-of-use, when youget going with the program, you discover just beneath that spartan surface lies a sparkling gold mine of astrological treasures. Take, for instance, the built in World Atlas with coordinates, time zones, and time changes for nearly anywhere in the world. Just start entering a city name and Kepler begins searching through its data, matching you letter for letter until you usually discover that the program has won the race and come up with your desired location and all its pertinent data before you've completed the entry. Take, for instance, the three different and complete astrological reports included with the program -- Cosmo Natal Report, Cosmo Compatibility Report, and the transit-based Cosmo Future Forecast -- plus Kepler's ability to easily create and integrate its own text files. This unique facility allows not only for the incorporation of your own personalized interpretations into the program, but also makes available an engrossing and ever-growing collection of reasonably priced full-blown interpretation reports in the Kepler Options Catalog. Want a big tease? Okay. How about a specialized natal report like Karmic Insight, Adult Report, or Child Report. Or perhaps one of the intriguing forecast report modules like Lunar Return, Karmic Forecast, Business Forecast, or even the Naughty Natal. And it's nearly impossible to overlook some of the other fascinating reports like Karmic Past Life Report, the Cayce Report, Vocational Guidance, Flower Essences and Gems, or the Astroquest Horary Program. I gotta tell you, personally, I'm totally, utterly enthralled and esurient and I want 'em all. Take, for instance, the built in research capabilities where you can search all your files to find all charts with, say, Sun in Pisces, Moon square Saturn, or Venus in the fifth. But wait, that's pretty simple stuff. Agreed. You can also, and just as easily, run searches on all your charts for planets in specific modalities or elements, interplanetary degrees of separation, planets in harmonic aspect, planets conjunct a specific zodiacal or critical degree, planets stationary, retrograde, conjunct fixed stars, and on and on. Take, for instance, the cool Astroclock, which allows you to watch the continually updated positions of the planets in real time. And what else does Kepler offer? Well, all the basics of day-to-day charting for wheels and tables are here, of course. Natals, returns, progressions, transits, and composites, all with your choice of zodiac, house system, and specific preferred position adjustments such as Draconic and Tobey. You've also got relocations, midpoints, trees, harmonics, angular distances, arabic parts, and tabulated compatibility calculations. A big plus with Kepler, particularly for shops and services, is that the user doesn't really even have to know anything about astrology in order to run the program. Quite frankly, as alluded to previously, the user doesn't even have to know much about programs to run the program. Everything is here, everything is accessible, everything is available with unprecedented ease. You want to calculate transiting midpoints to progressed planet listings? Go ahead. Simple. And you'll find that it's just as easy to create more complex printouts such as a composite between Joe's progressed chart and Jane's natal - and then calculate the transits to this composite, or a solar return to it, or practically any number of complex combinations you can think of. You want to customize your chart wheels and data tables? Be Kepler's guest, and, while you're at it, you can customize all your royalty free printouts and reports to include your name, or company name, and your contact information. But, what if you find yourself in some kind of a sticky-wicket with Kepler? Well, I hate to repeat myself, but... easy. In that unlikely event, you can take advantage of Cosmic Patterns free phone,fax, mail, or email customer support. Kepler is updated quite regularly, and the latest version, Kepler 4.2, has added a plethora of delicious new attributes. Headlining the list is the exciting Live Mini-Reading -- a personalized multimedia presentation of your natal chart with color, pictures, music, and spoken interpretations. 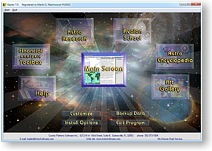 Beyond that, some of the additional enhancements include a data collection of 5,000 famous people, places, and events, so you can start testing your research theories right out of the box; new import, printout, and research capabilities; on-the-fly time adjustments that can be very handy for birth time rectification; and the ability to calculate returns of all the planets plus five major asteroids. In addition, Kepler 4.2 has a thoroughly revamped help system, which in effect makes the manual obsolete, and in conjunction with the fantastic online Astro Encyclopedia reference work, you've pretty much got yourself a total astrological learning and information system. So, there, now. See? I told you Kepler was easy. And now you know it's fun and powerful, too. Just like its namesake, Johannes, Kepler is a dynamo of an astrologer's assistant. This is one program that I guarantee won't just sit there taking up space on your hard drive waiting for you to figure it out.